Intersession at the Rush Rhees library is a delicious interlude. The computers run faster and time goes slower. This break I had the chance to leisurely explore the Art/Music Library on the Ground Floor. Like many, my attention is immediately drawn to the large mosaic adorning the side wall area. 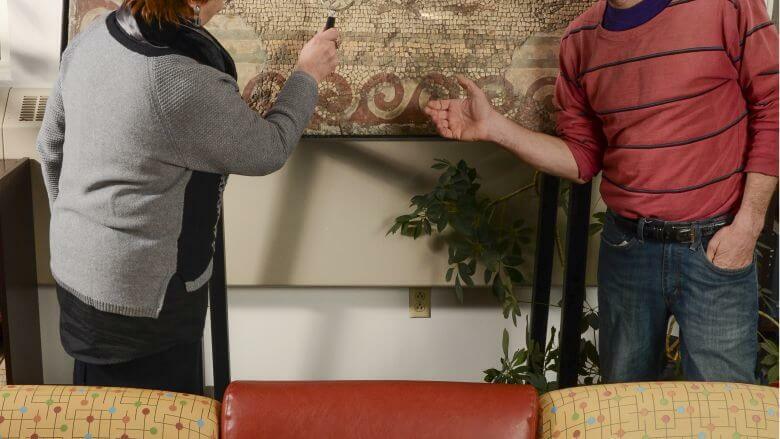 As if an art object from the third century B.C, isn’t interesting enough, Art Library Head Stephanie Frontz filled me in on the mosaic’s fascinating modern history and journey from war torn Asia Minor to Rochester. Originally, the mosaic had been part of a floor in an opulent Roman-era villa in the luxurious resort town of Daphne of Antioch. During the 1930’s, Antioch was still part of Syria, although today it belongs to Turkey. At the time of excavation, undertaken in 1939, Syria was a French colony. In May 1940, Mussolini declared war on France. As war spread to the Near East, Italian forces threatened the French colony. Possibly to avoid capture by Axis armies, Syria gave a portion of the finds to participating institutions in the United States. When one enters the Art/Music Library on the Ground Floor of Rush Rhees Library, it’s hard to miss the large 3rd century mosaic that stands against the far wall. During tours of the library, visitors are always asking about it, and students are intrigued by it and want to know its history. 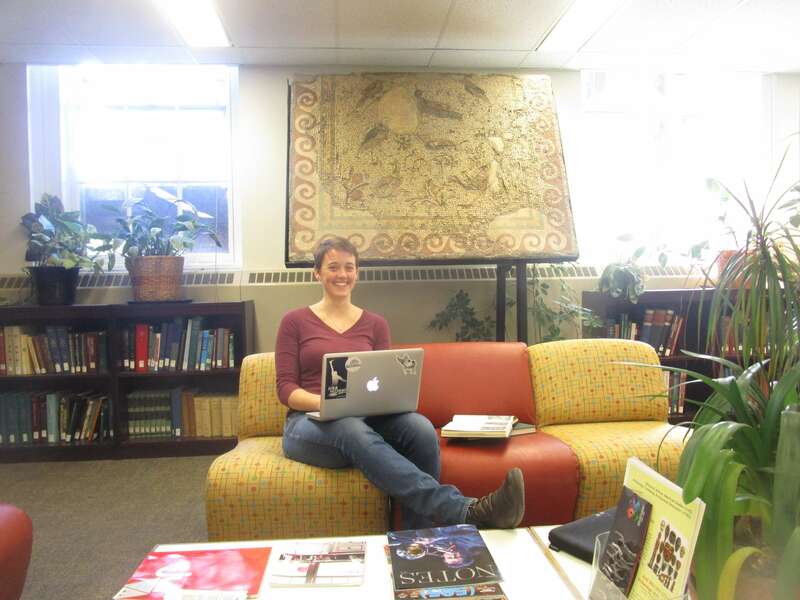 Senior Kate Cowie-Haskell, Anthropology major/art history minor works in the library and enjoys the conversations the mosaic sparks. This mosaic, decorated with birds and flowers within a commonly used wave pattern, is one of two acquired by the Memorial Art Gallery in 1942. The mosaics were excavated by the Committee for the Excavation of Antioch and its Vicinity in 1939. Participating institutions were Princeton University, The Worcester Art Museum, Wellesley College, the Baltimore Museum of Art, Dumbarton Oaks Research Library and Collection, and the Musees Nationaux de France. 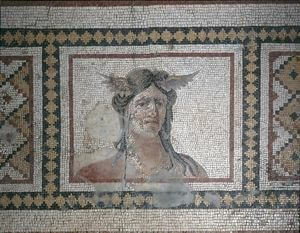 The MAG purchased this mosaic and the one depicting the head of Tethys, a Greek goddess of the sea, which is on display at the MAG, from Princeton University. Both mosaics had been part of a floor in an opulent Roman-era villa in the luxurious resort town of Daphne. The bird and flower mosaic acted as an entrance panel to what may have been an open-air fountain courtyard. Mosaics are designs made from tesserae, small pieces of colored stone or glass, embedded into a flat, prepared surface of damp concrete-like material. Glass tesserae are much less durable than stone. As a result of wear and deterioration, the blue, blue-green, yellow-green and red glass tesserae in the bird and flower mosaic have lost their original luster. At some point after the MAG acquired the mosaics, painted restoration of the design was undertaken. When the acquisition was announced in Gallery Notes, Jan-Feb. 1942, pictures of the mosaics show the damaged areas lacking designs. When pictured in a Porticus article in 1982, the missing design has been painted in, and that is as it appears today. While working at the MAG Library, I learned the Birds and Flowers mosaic was in storage, and I fell in love with it when a staff member showed it to me. I felt the mosiac–forlorn looking in the dark alcove–should be seen and enjoyed. Suggesting it could be displayed at the Art Library on the River Campus, the MAG staff graciously agreed. The mosaic was carefully moved to Rush Rhees in 1981, and continues to grace the Art/Music Library. Truly a Gem of the Genesee. Letha Ridley (1911-2015), second ever African American principal in the RCSD. And a 1958 photo with Martin Luther King.